We’d love your help. 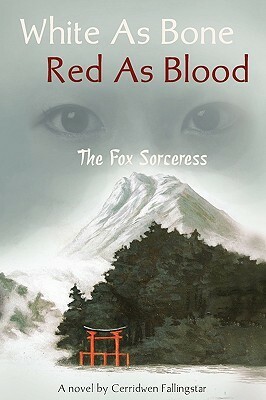 Let us know what’s wrong with this preview of White as Bone Red as Blood, the Fox Sorceress by Cerridwen Fallingstar. To ask other readers questions about White as Bone Red as Blood, the Fox Sorceress, please sign up. This novel is set in 12th century Japan, just as the most artistic age in Japanese history is making way for the age of the samurai. Powerful families fight to control the throne at a time of great change. The story is told by Seiko Fujiwara, poet, sorceress and closest confidante of the Empress. Seiko‘s life and destiny is changed at age 11 when her mother, a priestess of Inari is murdered during the battles between the Heike and the Genji for control of the Japanese throne. This is an interesting novel set in feudal Japan. Seiko’s marriage, her love affairs, her participation in palace intrigues, and her role as a healer make for engrossing reading. Seiko’s role as the Empress’s confidante sees her well placed to participate in and describe life at the court. The characters in this novel are memorable, if not always likeable. Their actions are sometimes difficult to accept but are understandable within the world portrayed by Ms Fallingstar. I enjoyed this novel both as a work of fiction but also as a reminder of a fascinating period in history.